"The QAP cadre has been a great opportunity to work with amazing educators from around the state. I have learned the importance of deeply understanding the keys of quality assessment. I've had the opportunity to learn, try something out, and then adjust and try again within a supportive community of learners. What struck me the most was the simplicity but importance of clear learning targets. Getting that solid foundation down will allow me to continue to build on my learning." Con-grad-ulations are in order for the first Quality Assessment Practices Cadre! 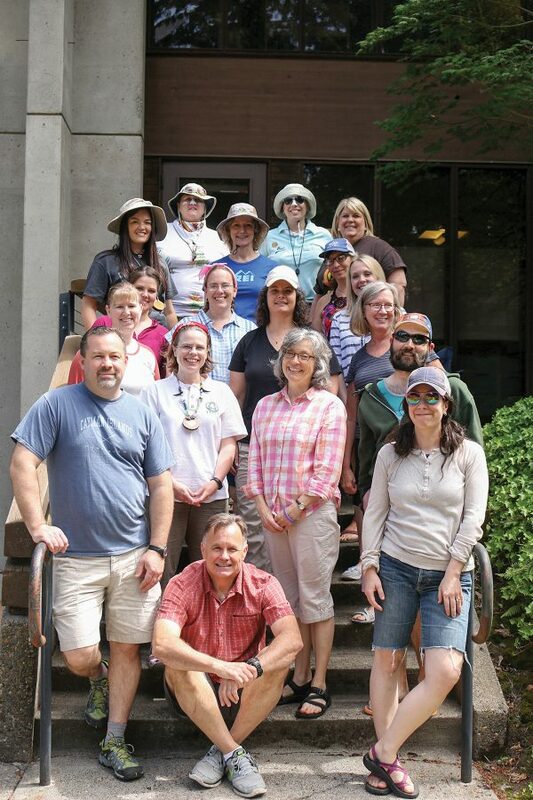 This group of 14 educators have dedicated the past 18 months to learning about quality assessment, conducting action research in their classrooms, sharing their knowledge with peers around the state, and leading learning in our pilot schools. The Quality Assessment Practices (or QAP) cadre was established in January 2016 in response to one of the 11 recommendations from A New Path for Oregon: System of Assessment for Meaningful Student Learning. That policy paper — crafted in partnership with the Chief Education Office, the Office of the Governor, and the Oregon Department of Education — called for more robust professional development for educators to improve classroom assessment. OEA developed this program to respond to that need. In the first year, six statewide leaders went through a rigorous application process to join the QAP team. The St. Helens Education Association in partnership with the St. Helens School District, agreed to be a pilot site for implementing district-wide professional learning. Teacher and administrator teams from each of the district’s four schools also joined the QAP 1.0. The 14 teachers and four building principals along with statewide leaders first met in January 2016 for four intensive days of learning about quality assessment practices, led by OEA staffers Erin Whitlock and Andrea Shunk, and assessment expert Jan Chappuis. QAP 1.0 continued to meet monthly on Saturdays to share what they learned, what they tried in their classrooms, and to plan for ongoing action research. Often, teachers shared what didn’t work, learning from their failures and seeking help and assistance from their colleagues on how to reiterate a lesson or instructional approach to try it again. This school year, the St. Helens teacher leaders led professional learning for their peers. Teachers from each school volunteered to be part of school-based PLCs where they learned about the purpose of assessments and how to use learning targets to help improve student learning. About two-thirds of the teachers at each St. Helens school site participated in this voluntary learning. Meanwhile, statewide QAP 1.0 leaders took on a variety of leadership roles. These teacher leaders co-presented at state and national conferences with OEA staff members, promoting the work of QAP and how the union can play a key role in supporting teachers’ practices. They also provided coaching and technical assistance to the St. Helens teacher leaders, helping to plan professional learning and providing a sounding board when the leaders faced challenges. "Since being involved in the QAP cadre, I have felt empowered to reflect and improve assessment in my own practice and also my colleagues’ practice. I have also really grown as a leader within my school community, something I didn’t even realize I wanted to do!" These statewide leaders also helped lead the next group of QAP leaders and pilot site members, essentially paying it forward to QAP 2.0. This included a series of book studies in the Medford School District, mentoring the new statewide leaders, and leading PLCs. These leaders also facilitated a three-day track on sound assessment design at the 2016 OEA Summer Leadership Conference, and will lead sessions at the upcoming 2017 OEA Summer Leadership Conference. QAP 1.0 also continued to meet in their PLC as they moved on their learning from the five guiding principles of quality assessment to strategies for using formative assessment in the classroom. Truly, this dedicated group of teacher leaders embody what it means to be reflective practitioners. They were all open to changing their instruction, even when it felt hard and uncomfortable. They found community with each other, sharing their frustrations and failures, but always supporting one another to move forward in service to students. In August of 2016, OEA started QAP 2.0 with four new statewide leaders and seven pilot leaders from Centennial Elementary School in Springfield Public Schools. Just like QAP 1.0, these teachers met on Saturdays, conducted action research, shared successes and failures, and planned for schoolwide professional learning that will start this August at Centennial. Now, OEA is launching QAP 3.0. Applications for statewide leaders have been turned in and the Banks Education Association in partnership with the Banks School District has agreed to be the next pilot site. OEA will also launch an online course for English Language Arts teachers later this fall. Stay tuned for more information on that course.